Wordless Wednesday is an ongoing blog-prompt hosted at Geneabloggers. The author frequently uses the opportunity to share the vintage postcard collection of her grandfather, Donald C. Minor. My branch of the Minor Family lived in Greene County, Pennsylvania for over 16 decades. Most of that time my ancestors lived on a farm outside Gerard’s Fort, on a tiny back road called Ceylon Lane. The closest large town was also the county seat — Waynesburg. It was the political, economic, social, and educational hub for generations of Minors. 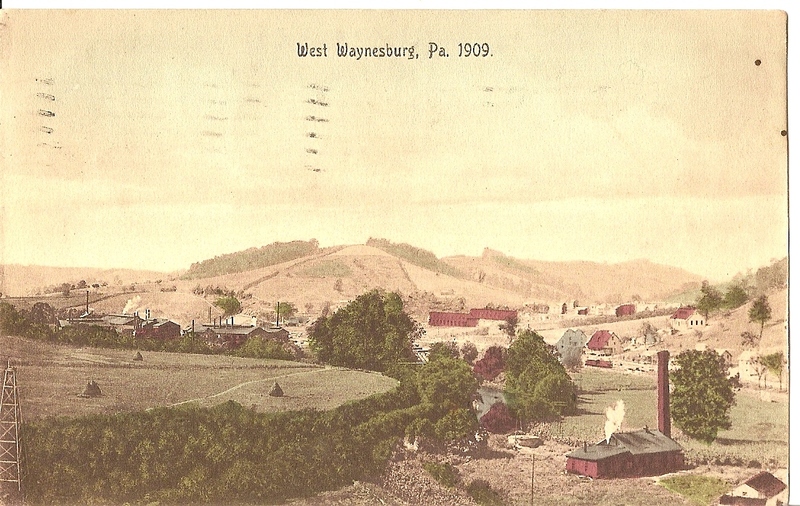 In this artochrome postcard from my grandfather’s collection, a German printer has lithographically processed a half tone photograph to create a full color photocard of west Waynesburg. The Waynesburg of my childhood family reunions didn’t look like this. Donald and my grandmother, Kerma Bradford Minor, had moved from the farm in the 1950s, and lived in a brick house on a hill, with a huge side yard and a carport covered by grapevines. I remember Waynesburg as blocks and blocks of homes surrounding the Waynesburg College campus, with a main street that ultimately led to an ice cream parlor, the only building that really counted for anything, in my opinion. When I look at this 1909 view I am puzzled by the smokestacks and large rectangular buildings. From what angle was the photographer observing the town? While trolling the internet I happened upon Historic Map Works, a site that sent my heart a twitter. 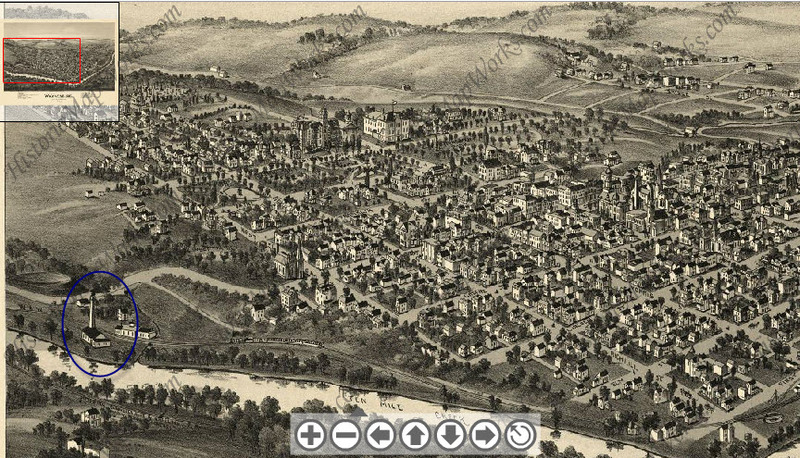 This 1897 bird’s eye image of Waynesburg was among the Greene County collection. I spotted a building that appears on both this image and on my granddaddy’s postcard. This bird’s eye image gives a greater sense — though mightily flattened out — of how large Waynesburg was at the turn of the 20th century. The 1909 autochrome reduces Waynesburg’s scope, but stays true to the topography of its land. Taken together the images provide a framework for my family stories that I find just fascinating. My eye turns inward, images now combined, and I soar like a crow over town; imagining my family walking these streets, wandering through shops, attending weddings in churches, drinking lemonade with school chums on shaded porches. What stories can my family heirlooms now tell me? Previous Article Mapping My Ancestors: Where’s Donald? It is amazing what you can find on the internet. Looks like you did a fine job in searching this information. It is very interesting information. Every other day I stumble on some map or record or photo that nails down some family story. I am amazed by what I can do tapping on a keyboard! Thanks for stopping by! Interesting… Donald and Kerma where my aunt an uncle. I remember Bobby, two very pretty daughters…I think Donna and Marilyn were their names, and Johnny. I remember that after Donald died, that Kerma moved up on northside. As a kid, I remember visiting the farm just outside of Gerards Fort, where I thought Donald and Kerma lived. I remember being scared by being so upclose to the sheep (surrounded by them) on that farm. That experience was probably in the early to mid 1950’s. Great Grandma Minor (Donald’s mother) died in 1954, and I remember attending her funeral. Great Grandma Minor had lived in the big buffbrick house on High Street that later became Neubauer’s Flowers. I have many memories of running around/playing in that house. Hot damn! WE are cousins. My mother, Marilyn, remembers you and your sister very well; and Grandma Minor’s buff brick house! Please contact me at dkaysdays at gmail.com; I would love to trade tales! Yep, that makes us cousins. My siblings are Skip (mortician), and Linda(Vice President of some SETA program for Washington and Greene Co’s)…….I am the blacksheep that stayed in the Army for 23 years and flew helicopters. No, Helen and Jesse Alonso (Lon) Bell were my grandparents. Their son, Robert (Bob) Bell is my dad, his sister was Janie Bell….